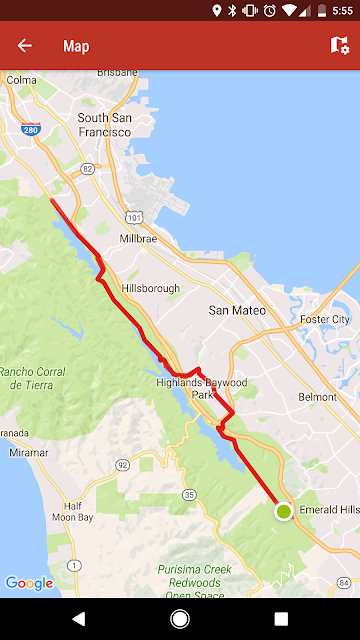 Before diving into the details of this battery pack, here is a screenshot of the route that I took. This was captured by MapMyRide. The design goal for this battery pack was to simply cram as much energy storage into a thin box as possible. I opted for a non-balanced, non-monitored and non-protected pack to ensure that as much volume as possible is reserved for the battery cells. The additional requirement is that the pack must be able to source very high currents. This pack as designed can deliver 2500W continuously and can peak near 4kW depending on how long the burst is and how much heat I am willing to tolerate. I will likely add a 120A fuse in the remaining cavity, just in case a short occurs. Due to the simplicity of this battery pack, the complexity of the charger is increased. 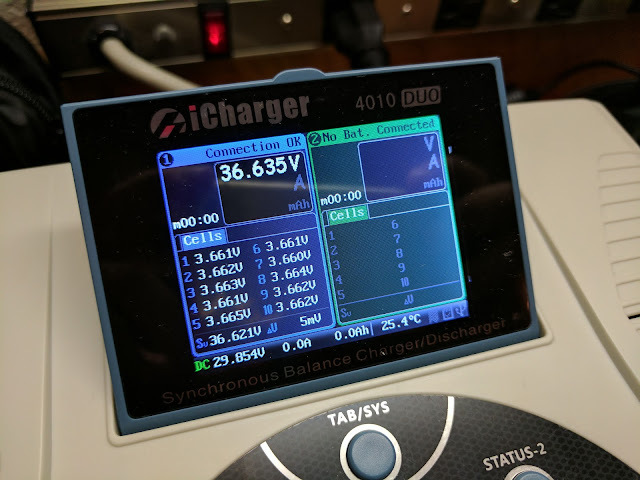 A balancing charger must be used to ensure that the individual cell voltages are equal. I have had very good luck with discharging this pack under heavy loads. The cells will remain within a few mV of one another. I have both an iCharger 1010B+ and an iCharger 4010 Duo. The 4010 Duo has some incredible capabilities and can deliver a continuous 40A charge current. That is far more than required to charge this pack. I selected the LG MJ1 cells for this pack. These cells have a maximum continuous discharge of 10A with a stunning 3.5Ah capacity. This 10A continuous discharge is relatively low but when arranged in a 6-parallel configuration can provide a high continuous discharge current of 60A. 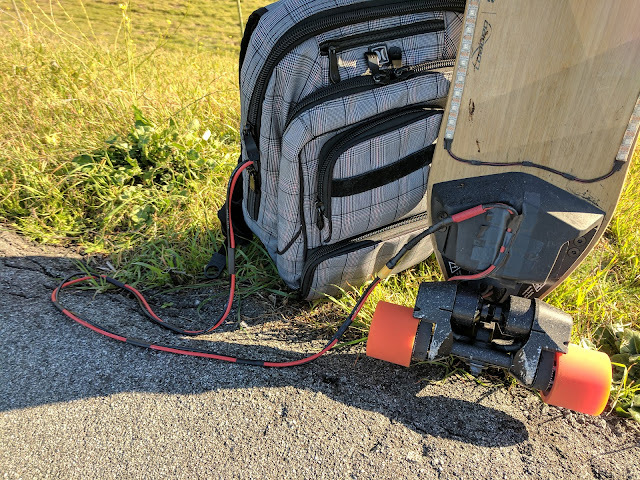 This rivals the internal pack of the Boosted Board which uses far more resilient LiFePO4 cells. The LiFePO4 battery chemistry sacrifices volume/weight energy density for increased power. 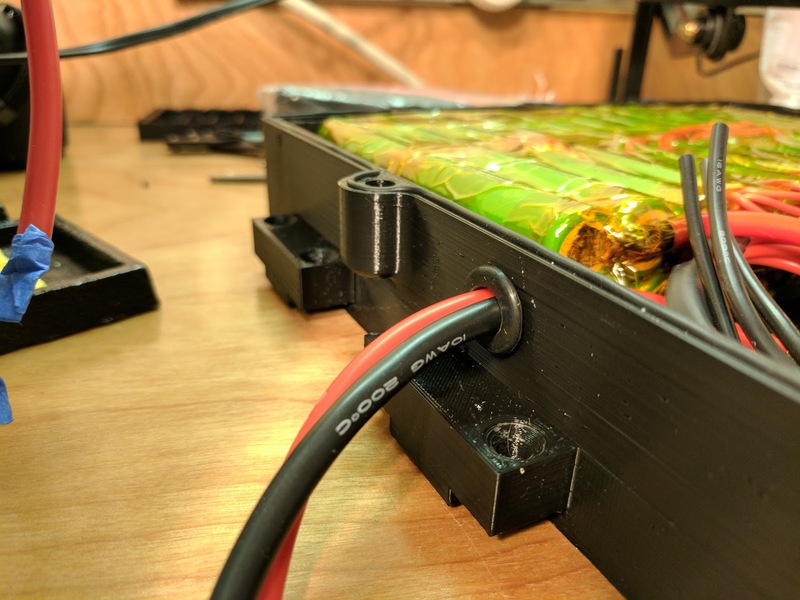 The Voyager pack has 60 cells mounted inside a 3D-printed enclosure. There are cutouts for the high-current primary load connector and a multi-pin aircraft-style connector for charging. There are also wings on the ends for attaching the battery pack to mount points on the Voyager board. We can just ignore those when using this battery in my backpack. You might think that this battery pack is quite large and I fully agree. The idea with having known mount points is that different battery packs can be designed and installed depending on the requirements of the trip/day. I have considered building a 10S3P pack with higher-discharge cells which sacrifices range for weight. The cells are connected to one another using nickel battery tabs. This is a significant step up over the soldered battery packs that I have experimented with previously. I am investing more time and money into Voyager so I decided to opt for the right tools for the job. My workbench showing candidate cells and battery welder. Let the games begin! The cells are arranged in groups of 6 which are then placed in an arrangement that allows for both positive and negative to end up near the front left of the pack. The individual groups of 6 were then tabbed together and wrapped in Kapton tape. Kapton tape is great for this application as it can tolerate a wide range of temperatures and the adhesive is typically very strong. The balance leads for each cell are routed out and terminated with tape while the pack is constructed. Once the cells were arranged into the complete 10S6P configuration the pack was flattened and wrapped entirely in Kapton tape to improve strength. The pack is nearly ready to be installed in the final enclosure. At this point, all of the individual balance leads and high-current load leads are exposed and ready to be terminated. The pack is seated in the enclosure with closed-cell foam to dampen vibrations. This will help keep the board quiet while riding on rough pavement. A balancing charger requires a wire for each of the individual cells in a pack in order to ensure that all individual cell voltages are equal to one another. I selected a 19-pin aircraft-style connector. There are 11 pins reserved for the balance leads (system ground and 10 leads, one for each cell). I then split the remaining 8 pins into 4 positive/4 negative for the main charging current. I can also charge the pack through the main connector but this has the benefit of simplifying the charging cable. 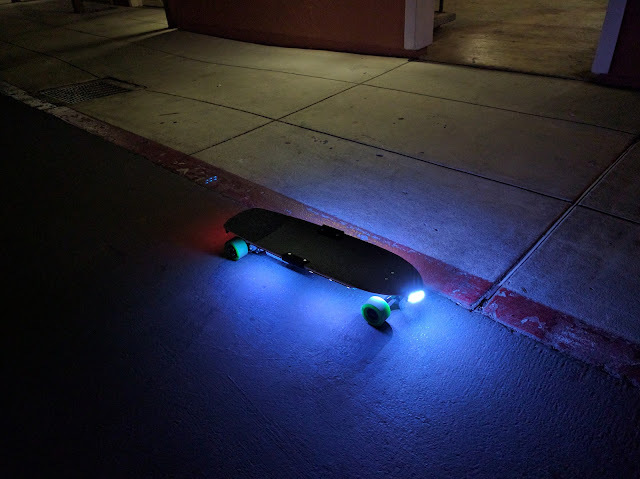 It also allows leaving the board powered while charging and accessories could be powered through the charge connector as well. When dealing with batteries I like to think of them as a heavy-duty power supply that cannot be shut off. Batteries can be quite dangerous to work with especially if a short-circuit is created. To ease the installation of the aircraft connector, I soldered pigtails to each of the pins and then attached one wire at a time. This ensures that I only ever have one wire exposed at a time and removes the chances of an accidental short circuit. The battery is sealed by a lid that attaches via 9 M5 screws into brass heated-insets. A 2mm rubber o-ring is used to prevent dust from creeping into the pack. Prior to sealing the box I applied some outdoor window silicone to any port holes (ie: the primary load cable) to prevent dust from breaching the case. I also used grommets where possible. Prior to installing the lid, additional foam was installed on the top of the cells. Installing the lid was quite easy with just 9 M5 screws. The weight of the cells is primarily supported by the lid, but they are also press-fit between the case walls for a snug fit. Next a charge cable was created to match the pinout of the charge connector. This allows a quick connection to an external charger. There is one caveat with this design in that the charger must be connected to the cable before the battery. The risk is that the banana leads could short together. I may consider replacing them with an XT60 connector in the future. That pretty much concludes the construction of this battery pack. It is a very simple design, which has risks. 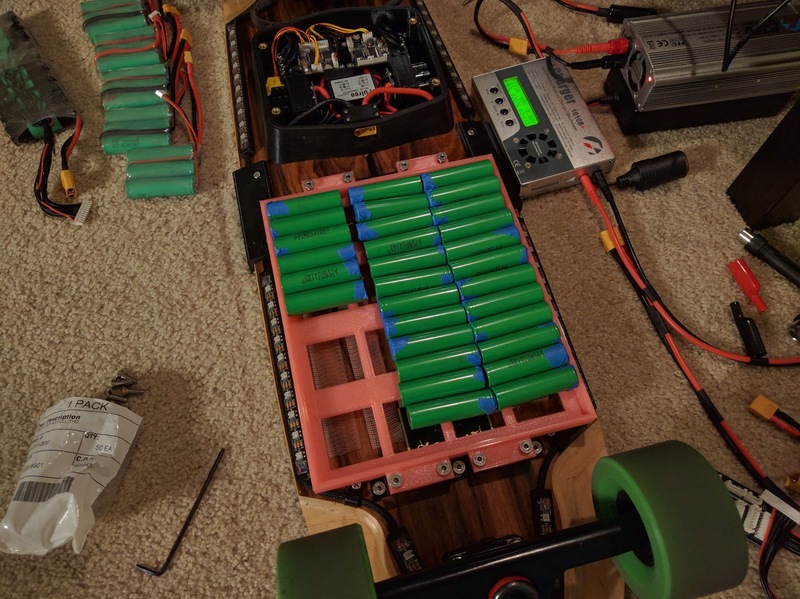 I would like to look into designing a battery system with built-in balancing and thermal management functionality. Right now I make an assumption that I can draw 60A from this pack continuously, but this is very unlikely to be possible in practice. I would expect the pack to get into a thermal run-away situation due to the lack of cooling. Thankfully, this pack rarely sees such large loads and when it does, they are just seconds to a minute in length (think hill climbing). Here are a few more glamor shots of Voyager. The major outstanding TODOs are a remote with more precision and improvements to software, namely to speed regulation. I need to invest some time in writing tests before putting my life on the line with a long trip on Voyager. If you made it this far, thanks for reading! Feel free to drop me a line if you are interested in what you see here. Awesome build and site! I am working on a Bluetooth remote for the VESC on my site: www.radicalcreation.com Check it out if you want and feel free to post any build logs you want! I'm quite curious about your brushless controllers on voyager. Any more details which you can publish yet? Where did you source the batteries from? Was it through batterybro? wow this is so cool..
You can fix old dead 18650 lithium battery as well.